Dr Fred Fialho Teixeira has been working in the field of digital architecture for the last 15 years. He has previous academic and research experience, and he was an Awarded Fellow at the Media Arts and Technology department, based in the California Nano Systems Institute. He co-established and developed an international research program on the studies of Perception of Space in Architecture and Culture, focusing on the use of Augmented Reality and its cognitive spatial affects. 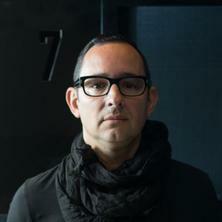 His architectural practice includes being part of world leading practices such as Zaha Hadid Architects, among individual prizes in international art and architectural competitions, he also holds professional degrees in architecture by both the Portuguese Chamber of Architects (OA) and the Royal Institute of British Architects (RIBA). Fred's research focuses on spatial design through an intersection of new media and computational design strategies with a focus on biological paradigms. Presently he integrates the use of virtual reality and algorithmic design to enable a next-generation of sustainable architecture in terms of advance manufacturing and environmental and cultural sustainability. The use of biological strategies into architecture to envision future applications of Biotechnology and Nanotechnology. Emergent strategies applied to design innovation. CNC, Laser Cutting, Robotic Fabrication. Frederico Fialho has been actively involved in international academic and research relations, as a founding element of multiple international collaborative research projects at European level. The recently launched Media Architectures and Spatial Systems (MASS) international project focuses on researching a systemic strategy between fabrication and immersion by combining robotic and virtual systems in an integrated design approach. Also in tandem with his research, the POSIAC international European Union research project focused in the perception of space in architecture, which included the use of Augmented Reality allowing certain degrees of agency and interaction with architecture. Presently Frederico’s research expertise ranges between the areas of Computational Architecture and Immersive Environments with a focus in biological design paradigms. The digital design realm is an integral component of his research and design explorations, which departs from intuitive diagrammatic strategies into computational design thinking and subsequently translated into digital fabrication processes. Additionally, the field of immersive environments contributes to computational design as a novel method of research, where natural processes of cognition and perception establish an embedded integration of new media and architecture. Teixeira, Frederico Fialho and Teixeira, Muge Fialho Leandro Alves (2018) The one and the multiples. Brisbane, Australia, State Library of Queensland. Teixeira, Muge Fialho Leandro Alves, Teixeira, Frederico Fialho, Donovan, Jared, Caldwell, Glenda and Burden, Alan, Robotic Morphologies, Istanbul Design Biennale, Turkey, . Media Architecture and Spatial Systems: Mediated Realities in Architecture (2018) . Edited by Frederico Fialho Teixeira. Annual Design Review, 27-28 September 2018, Sydney. Frederico Fialho Teixeira and Muge Belek (2017). A transvergent approach to design. In Perception of space in architecture and culture: adhocratic spaces (pp. 78-81) Germany: Spurbuchverlag. Teixeira, Frederico Fialho and Belek, Muge (2017). Adhocratic spaces. In Perception of space in architecture and culture: adhocratic spaces (pp. 10-26) Germany: Spurbuchverlag. Teixeira, Frederico Fialho and Belek, Muge (2017). Spaciocracy. In Perception of space in architecture and culture: adhocratic spaces (pp. 116-131) Germany: Spurbuchverlag. Fialho Teixeira, Frederico and Belek, Muge (2014). On other natural spaces. In Sensory living: perception of space in architecture and culture - summer school 2 (pp. 55-68) Germany: Spurbuchverlag. Fialho, Frederico Fialho and Yurdakul, Cagil (2013). Virtuality/Augmented Reality, Turkey. In Ulrich Nether (Ed. ), Perception of Space in Architecture and Culture Study of Industrial Ruins (pp. 108-113) Baunach, Germany: Spurbuchverlag. Fialho, F. and Belek, M. (2015) 1+1=3 Systems of Didactic Communication. The International Journal Of The Arts In Society, . Fialho, F. (2014) 2nd Istanbul Design Biennale Review. AIT, Gesundheit und Wellness, 26-26. Cordan, Ozge, Dincay, Demet and Fialho Teixeira, Frederico (2014) Adaptive reuse in interior architecture: a case study in Famagusta, Cyprus. International Journal of Architectonic, Spatial, and Environmental Design, 8 1: 1-15. Belanger, Zackery, Bernal, Guillermo, Ameres, Eric, Edwards, Seth, Fomina, Olia, Fialho, Frederico, Hambleton, Daniel, Marsvik, Christoffer, Puyol, Ana Garcia, Toulkeridou, Varvara, Schneiderman, Ben, Goldfarb, Sarah and Wisniewski, James (2012) Reactive Acoustics Manta Project. New York, NY, United States, Smart Geometry 2012. Fialho Teixeira, Frederico and Belek, Muge (2011) Evolutionary total artwork: biology, media and space. International Journal of the Arts in Society, 6 1: 87-98. Fialho, F. and Belek, M. (2009) Infotransportadores biologicos para arquitecturas ubiquas. Nada, 13: 74-95. Fialho Teixeira, Frederico (2015). Biology, real time and multimodal design: cell-signalling as a realtime principle in multimodal design. In: Bob Martens, Gabriel Wurzer, Thomas Grasl, Wolfgang E. Lorenz and Richard Schaffranek, Real Time - Extending the Reach of Computation: Proceedings of the 33rd International Conference on Education and Research in Computer Aided Architectural Design in Europe. eCAADe 2015 International Conference, Vienna, Austria, (551-562). 2015. Cordan, Özge and Fialho Teixeira, Frederico (2014). Adaptive 'Re-Mardin': adaptive re-use, beyond cultural and historical conversation. In: Suzie Attiwill and Philippa Murray, Situation: Symposium and Exhibition Proceedings. Situation Symposium, Melbourne, Australia, (200-209). 31 July - 3 August 2014. Cordan, Özge and Fialho Teixeira, Frederico (2014). Adaptive ‘Re-Mardin’: adaptive re-use, beyond cultural and historical conversation. In: Suzie Attiwill and Philippa Murray, Situation: Symposium and Exhibition Proceedings. Situation Symposium, Melbourne, Australia, (37-39). 2014. Fialho, F. (2014). Specificity in Morphogenic Design: Gastrulation as a Morphological Principle in Design. In: Alberto T Estévez, 2nd International Conference Of Biodigital Architecture and Genetics. II International Conference of Biodigital Architecture and Genetics, Barcelona, Spain, (332-343). 2nd - 6th June, 2014. Fialho Teixeira, Frederico (2014). Specificity in morphogenic design. In: Alberto T. Estévez, 2nd International Conference of Biodigital Architecture & Genetics. II International Conference of Biodigital Architecture & Genetics, Barcelona, Spain, (332-343). 2-6 June 2014. Fialho, F. (2014). Specificity in morphogenic design: gastrulation as a morphological principle in design. In: Bio-Digital and Genetic Architectures, Barcelona, Spain, (). May 2014. Fialho, F. (2013). Augmented Reality. In: Ulrich Nether, Perception of Space in Architecture and Culture Study of Industrial Ruins. Perception of Space in Architecture and Culture Study of Industrial Ruins, Baunach, Germany, (194-203). 2013. Fialho Teixeira, F. and Belek, M. (2013). Nurbulations: Gastrulation and Modeling Systems of Control in Generative Art. In: Algode, Tokyo, Japan, (). November 2012. Fialho, F. and Belek, M. (2012). Emosphera: Towards an Autopoeisis Synesthetic Space. In: Technoetic Telos, Greece, (). May 2012. Fialho, F. and Belek, M. (2011). Evolutionary Total Artwork. In: International Conference for Arts in Society, Berlin, Germany, (). May 2011. Fialho, F. and Belek, M. (2007). A novel approach in building acoustics: trans-active acoustical architecture. In: Internoise 2007: Global Approaches to Noise Control, Istanbul, Turkey, (). 28-31 August 2007. Teixeira, Frederico Fialho (2014). Function of the Bio: Computational Biology for Evolutionary Spatial Systems PhD Thesis, Department of Architecture, Istanbul Technical University. Composition Within a Virtual World: Creating the ultimate immersion through advancements in virtual reality audio and audio-visual interaction.